As long as you’re decking the halls this season, how about some cute wreaths to decorate the doors? 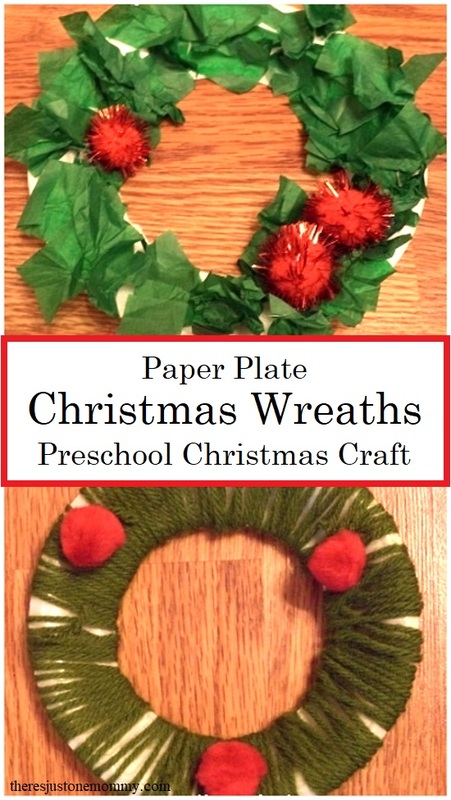 These 3 paper plate Christmas wreaths are fun kids Christmas crafts that are perfect for decorating with this season. Each of these homemade wreaths starts out with a paper plate that has the center cut out of it. You can find all the directions below. 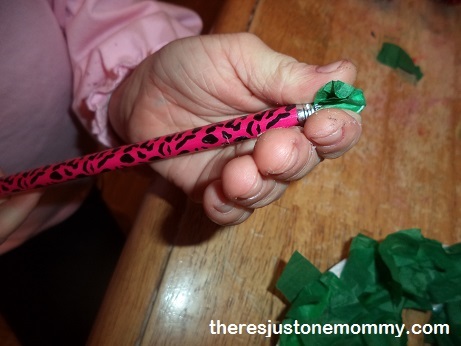 For the tissue paper wreath, cut up 1 inch squares of green tissue paper ahead of time. Use a paint brush to spread glue along the paper plate. Once the plate is covered, add some red pom-poms. For the yarn wreath, tie one end of approximately 1 foot of green yarn to the paper plate. 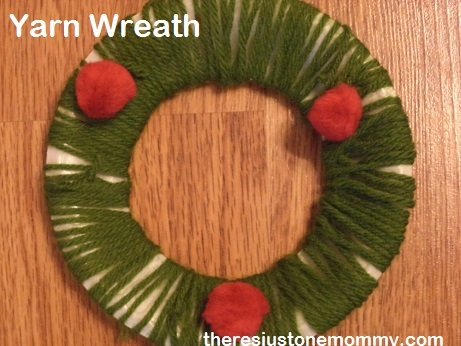 Have your child wrap the yarn around the wreath. When finished, glue a few red pom-poms to this paper plate wreath as well. The last wreath we made is a simple Advent wreath. I remember having an Advent wreath on the table as a child. Each week my mom would light a new candle. Once again, start with a paper plate with the center cut out. Cover the plate with squares of green tissue paper. The candles are made up of 3 strips of purple paper (about 3 inches long) and one pink strip (the last week of Advent). We made 4 yellow flames to glue to the “candles” as the weeks go by. This year, don’t just deck the halls with an expensive store bought wreath. 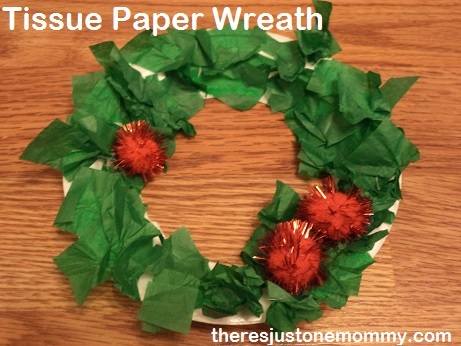 Let the kids make a few paper plate Christmas wreaths to help deck the halls. Thank you! They look cute on the doors! I adore the Christmas Wreath Crafts!! I keep putting paper plates on my shopping list and keep forgetting them! LOL! 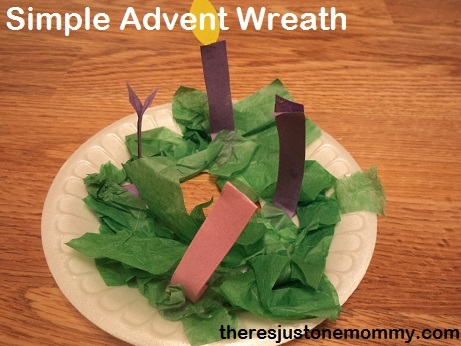 I love your Advent Wreaths, I think my little one would LOVE making that, so I NEED to get it. NEED! LOL! The wreaths are so cute! Pinned it! Thanks for sharing at Anything Goes Linkup! Thank you for pinning it! What a fun and inexpensive activity. I never thought of twisting the tissue paper on a pencil. Nice to know. Advent wreaths are very popular here in Germany. They are made from natural materials and sold at all the Christmas markets. As a child my mom always had one on the table. I’m sure it was a tradition past down through her family. Right now I have one who I can’t trust with a lit candle long…but one day we will have a real wreath on our table! They are all so fun and easy…win, win! What creative ideas! I love the yarn-wrapped one! Thanks for sharing these at the Thoughtful Spot!